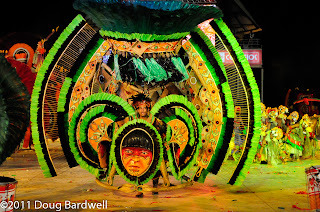 While many people attend Carnival in Rio de Janeiro each year, the Boi Bumba celebration is actually the second largest festival in all of Brazil. Many other towns have similar festivals, but Parintins hosts the biggest and most impressive of all. 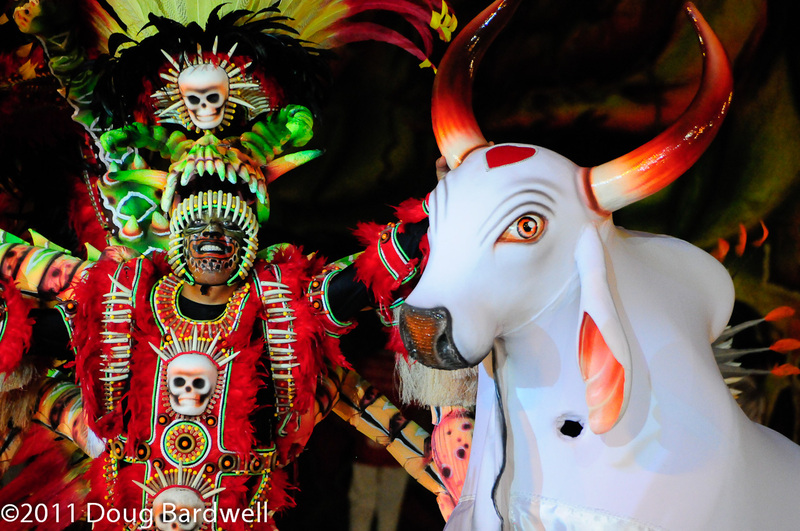 With incredible displays and costumes, the folk tale of Boi Bumba is re-enacted nightly for three consecutive evenings by two teams. The blue team called Caprichoso (cah-pree-show-zol) tries to outdo the performance by the red team called Garantido (gah-run-tee-dow). After three nights of non-stop music, dance, singing, fireworks, parades, giant puppets and story-telling; judges determine a winner. The winner of this year’s event, was Garantido, the red team, winning by 2/10’s of a point. Last year Caprichoso won the event, but this year, the red team seemed more energetic, and their performance was electric from start until finish Saturday night when this writer was in attendance. In this year’s event, the giant backdrops were wheeled into the stadium, one after another. Some were probably 30-feet in the air and always transformed themselves into something more than what originally met the eye. Often the pieces would open at the height of the music to display a beautiful dancer, who was eventually lowered to the ground and came dancing out to the delight of the crowd. 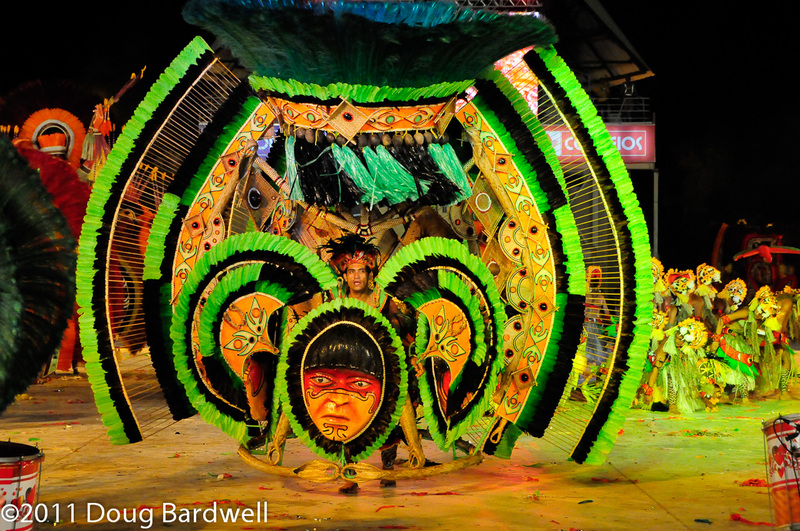 Costumes were incredibly lavish with feathers and flowers almost unimaginable in size and color. 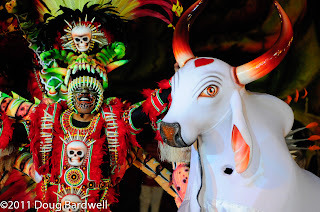 See the slide show for pictures from the 2011 Boi Bumba festival. It’s an incredible musical and theatrical event you won’t want to miss. Can’ t make it the last weekend of June? Fret not. The locals restage the event every time a cruise ship docks in Parantins. Often performers will be dancing right at the docks, and a very short trip will allow you to watch a re-enactment performance. Cruise ships that stop in Parintins this year include: Oceania Cruises, Azamara Club Cruises, Holland America, Princess Cruises, & Sea Dream Yacht Club. Boi Bumba is always held on the last weekend in June. Many locals wait all day in line for free admission to the show, but if you are willing to purchase a ticket, you can get in without waiting, and you’ll get preferred seating as well. Parintins is a town of roughly 115,000 people that swells by 35,000 on the Boi Bumba weekend. Hence, you need to make reservations early for a place to sleep. Many Brazilians will spend the night in a hammock on one of the many docked ferry boats which helps cover the overflow of people, but most Americans would probably prefer a normal hotel room. Making plans now to attend next year’s event is not too soon. Each year the crowd gets larger and rooms sell out sooner. Be aware you will need a visa to visit Brazil. It's easy to get but it can take some time. Plan ahead.